Google’s March to the Reviews Sea: What’s the Next Stop? Google has handled “Plus” reviews very differently in 2013 from how it handled them in 2012. The powers-that-be at Google now seem to want customers to leave reviews, and for business owners to ask customers for reviews. Sounds reasonable enough. But it wasn’t always that way. As you may recall, in 2012 Google started requiring customers to have a Google+ page to post a review (arguably a smart move) and then cranked the “review filter” dial up to 11. To me, the low point was when Google stated that it was OK to “ask” a customer for a review but not to “solicit” one – a meaningless distinction that even Google’s anti-spam filters couldn’t draw, given how many legitimate reviews it filtered and how many bad ones it kept around. January: Google loosens the review filter. 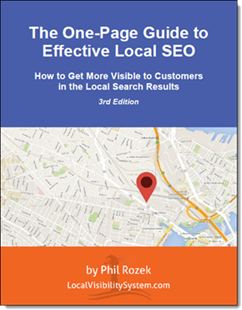 May: Google rolls out the “new” Maps – which lets users filter local-business results by review criteria. 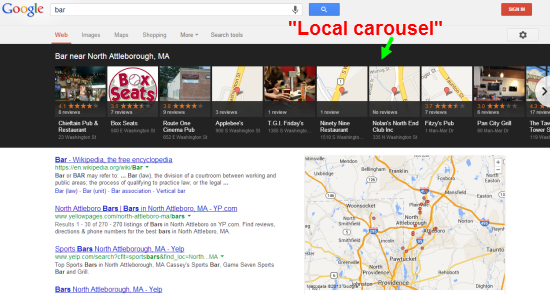 May: Google provides a means of getting reviews transferred from one Google+ Local page to another. June: “Carousel” results roll out. July: The 5-star rating system returns to Google+ Local pages and to the main search results. July: Google introduces the “review pop-up,” which makes most businesses’ Google+ Local pages hard to access. August: Google launches its City Experts program, to encourage “power reviewers” like Yelp’s Elite Squad members. August: Ratings distributions charts appear on Google+ Local pages. September: Google starts telling reviewers when their reviews have been filtered. October: Google offers review extensions for AdWords. November: Google offers the “reviews dashboard” and long-needed clarification on whether it’s OK to ask customers for reviews. We’ve determined Plus reviews have become Google’s golden children. Not only in terms of the steps Google has taken to popularize them (see above), but also in terms of their footprints in the search results. As Mike Blumenthal recently pointed out, the number of times reviews are mentioned or shown on a typical page of Google’s local results can range from 8 to 15. Of course, Google will never stop messing with the Plus reviews “landscape.” It will keep morphing, like the rest of local search and the online (and offline) world. And of course we can be pretty sure why Google pushes reviews so hard: to get more people using Google Plus actively. The more active Plus users / reviewers there are, the better Google can mine data, and the more money it can make from ads. But if the powers-that-be at Google want Plus to replace Yelp as the place to write and read reviews, the pace of change has got to slow down at least a little. That’s the only way customers and business owners will come to understand, enjoy, and mutually use Google Plus reviews – at least in the numbers Google wants them to. So, if Google’s march on Plus reviews continues in the direction it’s been going in for the last year, where might its boots fall next? Put another way: what hasn’t Google done yet? 1. The issue of that pesky reviews pop-up isn’t resolved. It’s a contradiction that Google played up reviews on Google+ Local pages but in the same month made it very hard for most customers to navigate to those pages. Something’s gotta give. 2. The “carousel” still only shows up for searches relevant to certain industries. It doesn’t show universally. If it did, that would mean – among other things – that users would be able to “filter” all the local business results from the main search results page. 3. Google’s Helpouts offering hasn’t rolled out yet. I wouldn’t be surprised if reviews somehow dovetail with it. 5. It’s already the 3rd of December and Google hasn’t surprised us this month (!). You never know what’s around the corner. A couple more days and I’ll think they’re slipping. My advice? Simple: this is the best time I can remember to encourage some of your customers to review you on Google Plus. It’s only going to get more important to have Google reviews, and it might get more complicated to get them.